Adam and Gemma book into Lassiter's secretly under "Mr and Mrs Smith", but their cover is blown when they are awarded the prize for the 250,000 customer! Adam and Gemma are on the front page of the Erinsborough News and Paul is moaning to Christina about it - Gemma isn't exactly his favourite person at the moment. Now he's had to write her a cheque for $1,000! Melanie arrives with some reports for Paul. She sees the toy that Jim made and enthuses about it. She's also got some more promotional ideas for Paul, like Christmas in July, karaoke night and murder dinners. He's not convince and says he wants something new. Gemma is back from her "girlfriend's" house. 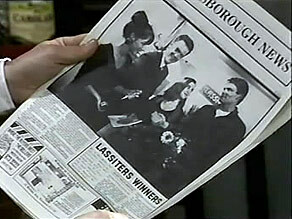 But Harold has seen the front of the Erinsborough News. Madge laughs her head off but Harold is not impressed. He says Gemma should have more morals! 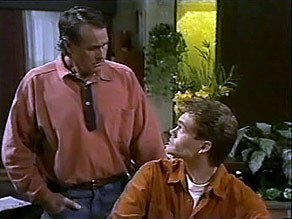 Doug has seen the picture on the front of the Erinsborough News too and teases Adam about it. Adam points out that he's got a share in $1,000 and Doug looks kind of jealous(!) There no word from Brad yet. Joe is eating his breakfast and not really listening to Melanie. He's thinking about Toby's heartbreak. MELANIE: Poor kid. I remember my first heartbreak. I cried for weeks and weeks. As they chat, Melanie gets the idea for an Iron Man competition at Lassiter's. Gemma is looking through the Situation Vacant page again, but can't find anything suitable. Adam comes round and Harold rolls his eyes. HAROLD:(stiffly, to Gemma) There is a Mr Smith to see you! Adam and Gemma talk about their new-found fame and then the phone rings. Gemma answers it and it's Lou Carpenter. Harold comes up and tells Gemma to tell Lou that Madge isn't there. She is rather surprised but does it. Melanie tells Christina that Paul is making a cradle for her - but he's hopeless, so Christina has to prepare to act grateful. Doug has been on the phone to Foreign Affairs, but there's no news yet. DOUG:(to Adam) And how's Mrs Smith? Found a job yet? Adam says his mate has turned up a job for Gemma at the University in Newcastle, looking after animals in a lab. But he's not sure if Gemma would want to move. Gemma is fed up of not being able to find a job. Harold thinks Gemma should take any job, even cleaning office blocks in the city at 3am! 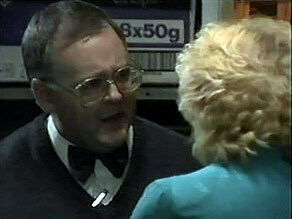 When Harold is in the kitchen, Gemma tells Madge about the phone-call from Lou Carpenter. She isn't impressed that Harold told Gemma to hang up, and rings Lou straightaway from the Coffee Shop phone. Doug is off to work as his customers are getting restless. Adam is going to man the phone and tells Doug to try not to worry. Gemma comes in as Doug is leaving. Adam doesn't tell her about the job. Paul has brought the cradle home. It's surprisingly good and Christina is very impressed. Madge tells Harold off for telling Lou that she wasn't home. He claims she is making a mountain out of a molehill. Madge thinks Harold is jealous of Lou. Anyway, Lou is still very depressed about his divorce and Madge has invited him to stay for a while. Harold is very angry but Madge refuses to un-invite him. HAROLD: You get back on that phone, Madge. Or else! JOE: No need to worry, mate. Absolute discretion. JOE: Hey, as far am I am concerned I never built that cradle...I've never seen that cradle...What cradle? Adam comes in to ask Melanie for advice about the job in Newcastle. He knows Gemma needs the job, but he's worried that he'll lose her. Melanie can see his dilemma. Madge and Harold row about Lou again. MADGE: I'm sick to death of being bullied! HAROLD:(shouting after her) Oh yes, run away from the argument! MADGE:(upset) If you're not careful, it won't be the only thing I'm running away from! When she's gone, Harold goes into the store-cupboard. 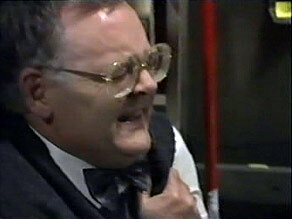 He looks very unwell and then falls to the floor - he's having a heart-attack.